Even though Chris Corchiani wasn’t born in Raleigh, he’s a hometown figure. Chris played basketball for the NC State Wolfpack, where he had an impressive career as the first NCAA Division I player to record 1,000 assists. In the 1990–91 season, he led the nation in assists per game average, at 9.7 per game. At the time he finished his career, he was in 5th place on the NCAA’s all-time steals list. Chris was selected by the Orlando Magic, with the 9th pick of the 2nd round (36th overall) of the 1991 NBA draft. In addition to the Magic, he played with two other NBA teams. He also played professionally in Italy, Turkey, Spain, and Germany. Chris lived all over the world playing basketball throughout the ‘90s, but when it was time to change gears, his love for his college town brought him back to Raleigh. He’s called the area home ever since, and is now a well-known member of the Triangle business community. 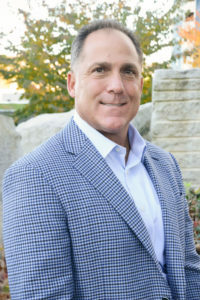 These days, when he isn’t working on the operations or customer service side of Tryon Title he enjoys boating, fishing, golfing, and spending time with his four children, Christopher, Jr., Tommy, Annabelle, and Hugo. After a 14 year professional basketball career in the NBA and Europe, Chris started his career as a realtor, and shortly thereafter, he became the owner of DNJ Mortgage. Under his leadership, DNJ grew from a 7 person brokerage firm to a mortgage bank with over $1 Billion in annual closed loan volume. The company operated in 7 states with 125 employees. In 2007, Chris founded Tryon Title Agency, and he is currently the managing member of the LLC. Chris is focused on serving the law firms the company supports as well as business development activities with realtors, mortgage loan officers and commercial developers. When he isn’t at the Tryon Title office, Chris supports a variety of charitable organizations across North Carolina through his advocacy and public speaking.